To serve as a platform for dissemination of information related to Public Grievances and to monitor the redress of these Grievances. To enable the citizens to lodge their grievances online. To enable Departments/Organisations to scrutinize the complaints and take action without delay. To reduce the loss of complaints in transit. To reduce/eliminate physical forwarding of complaints to the Departments Concerned. To enable the Departments to further forward the grievances to their subordinate offices and to reply back to the complainants. To enable the citizens to keep track of the status of their complaints online. Forwarding and movement to multiple departments. Tracking of grievances till redressed. Online status check-up of Grievances. Alerts and Status update through SMS/ Email. Lets the user submit the grievance. All the applicant information required to process the application is filled here. User can also attach documents required to process the application as well as enclosures given with the application. 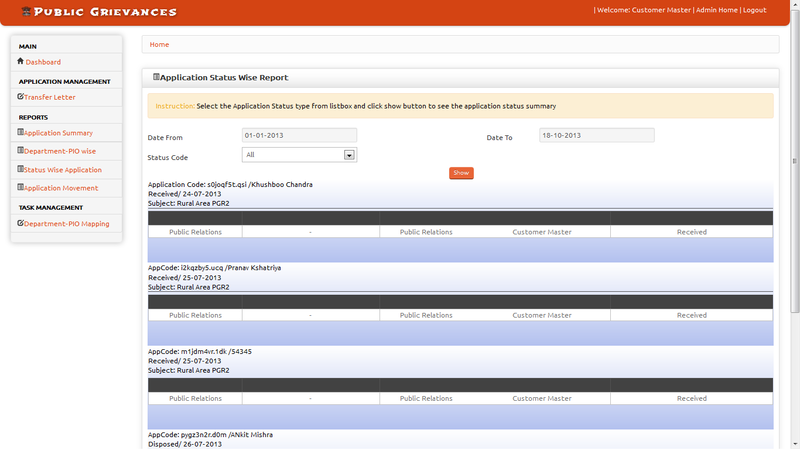 Lets the user view the applications submitted between a particular date intervals as well as to edit them at same time. 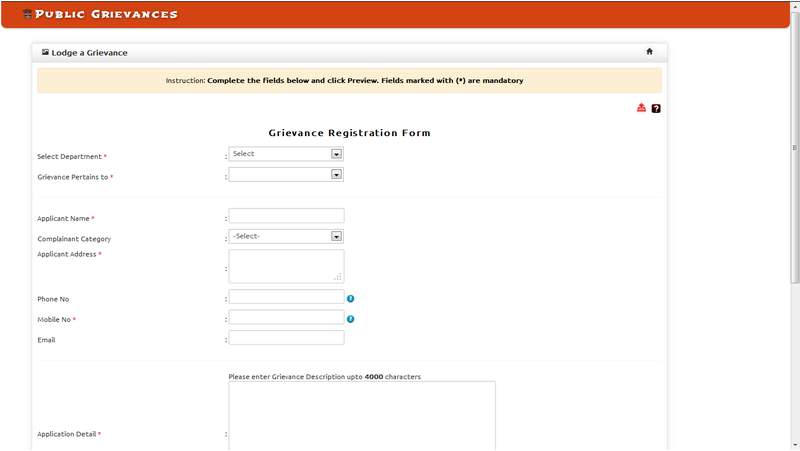 View Public Grievances Status form lets the user see the application status code and their serial numbers. When the user clicks on a particular application status code it goes to that corresponding form where the user can also edit that particular application status code. 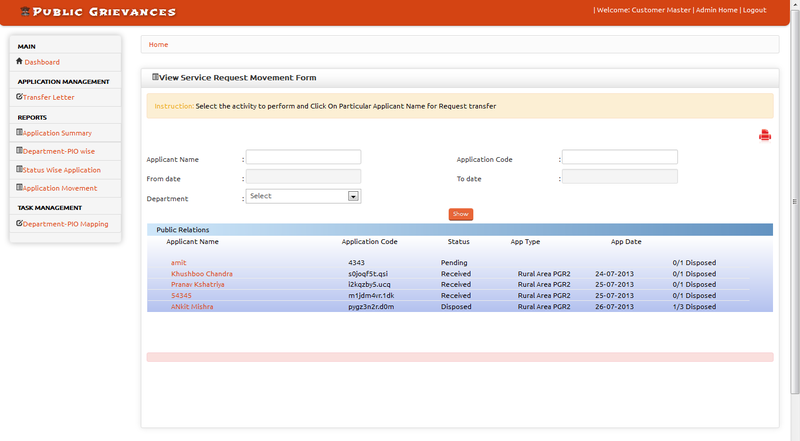 This form shows the user applicant name and their corresponding application codes. When user clicks on an application code application movement form of that particular applicant opens. 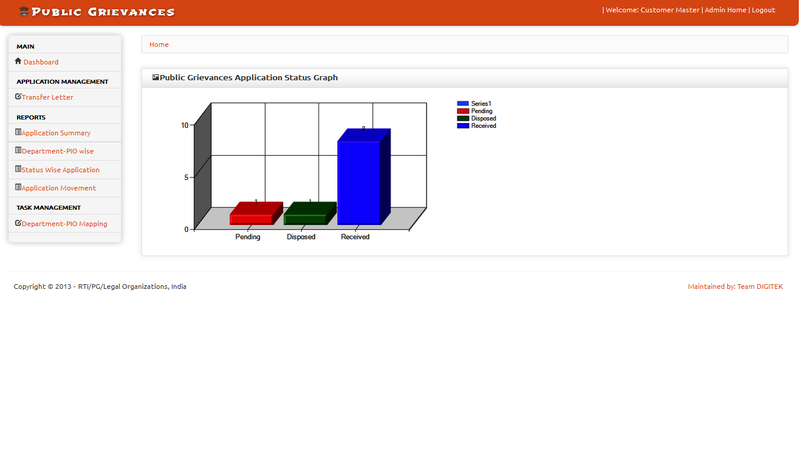 This report shows the application detail application status code wise. 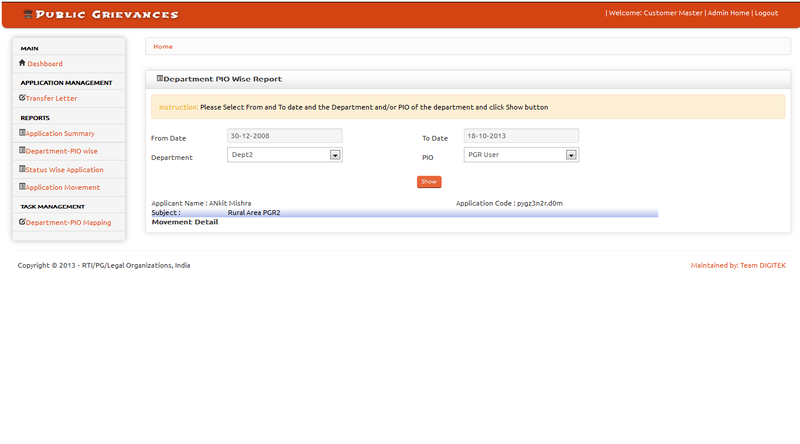 Here user can see that in which department the application currently is and which P.I.O is handling the application.